I ran out of package materials? Please contact your local Lodge and let them know. A request for more materials should be sent to Sandi Lougheed, SRPA President. Someone would like to make a donation of over $20? Please collect their full contact information. They will receive a charitable receipt in December. Donations under $20 do not receive a charitable receipt. I would like to send out a mass email or fax? You can download the Email/Fax Flyer found under Downloads in the sidebar. You are welcome to send this out. Who should the cheques be made out to? 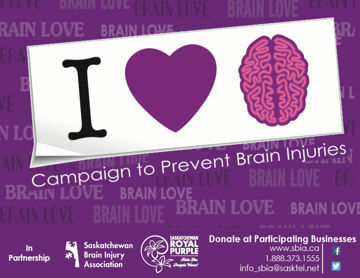 All cheques should be made payable to the Saskatchewan Brain Injury Association. When must I have my Campaign Package returned by? You should have your package with all materials inside returned no later than April 4. It should be submitted to your local SRPA Lodge. Please be sure to have collected all remaining BrainLove Stickers. As well, collect all Business Instruction Cards, Brochures, and Posters. I have contacted by our local media to do an interview? Please contact the SBIA Provincial office when doing an interview. We like to keep track of all media appearances. Please note that OnLine Donations can be made by clicking here.